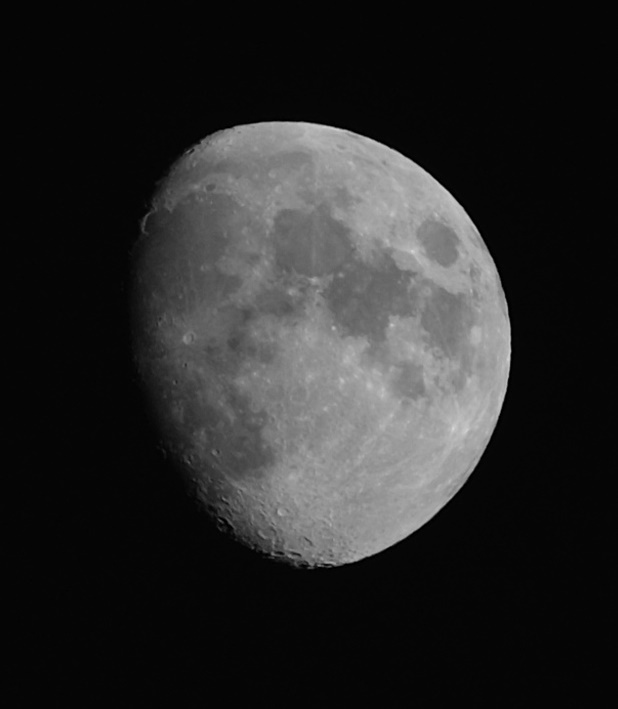 When I got into astronomy in my early teens one of the first things I wanted to do was photograph the Moon. Unfortunately it wasn’t so easy in the pre-digital era and I ended up equipping my own darkroom so I could push the slow ISO black and white films of the time. These days you don’t need a darkroom, but you do still need a telescope and ideally an interchangeable lens camera and a T-adapter. Or do you? If you can’t (or initially don’t want to) spend the £Several Hundred plus you’d need for a scope, camera and adapter, there is another way. You (or someone you know) may have a compact camera with a super zoom lens – loads of families have them kicking around unused between holidays. 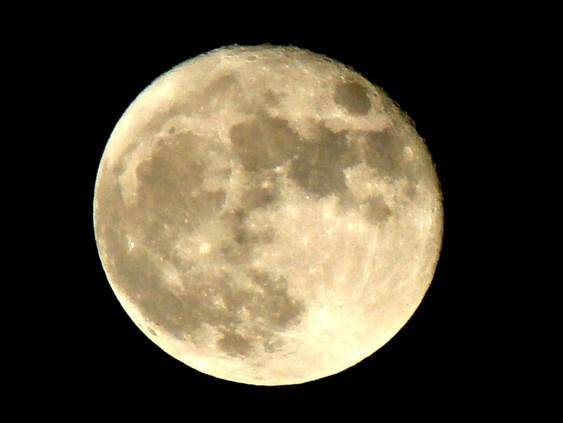 If the zoom is ten times or more, you can get interesting snaps of the Moon that show more than the naked eye. 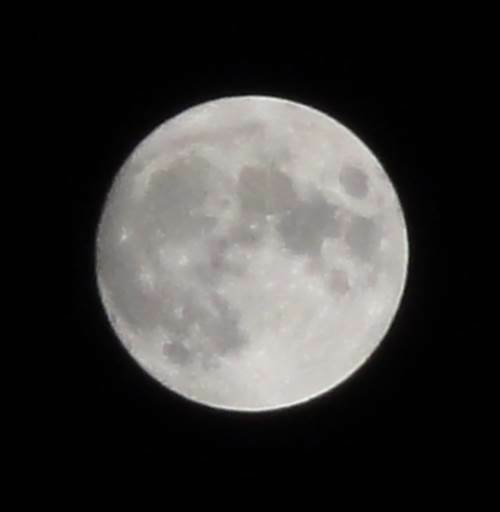 If your zoom is over twenty times, you can get Moon snaps that are quite surprisingly detailed. Here’s how. The Olympus I’m using for this article is an SZ-15 SuperZoom point and shoot camera, but I don’t want to give the impression I’m specifically recommending this particular model; I’m not. In fact, one of the much larger and more expensive super zoom bridge cameras would doubtless be better (though less likely to be just lying idle around your home since the last family holiday). There are a series of similar Olympus models, from the SZ-10 on, that include a long zoom lens; the obsolete models can be had pretty cheaply. Other manufacturers make super zoom compacts as well and some of them may be better than this Olympus. I chose this Olympus because it is cheap, available and common. I’ll quickly review its main characteristics, but I don’t want to go into full details here – there are numerous reports and reviews online. 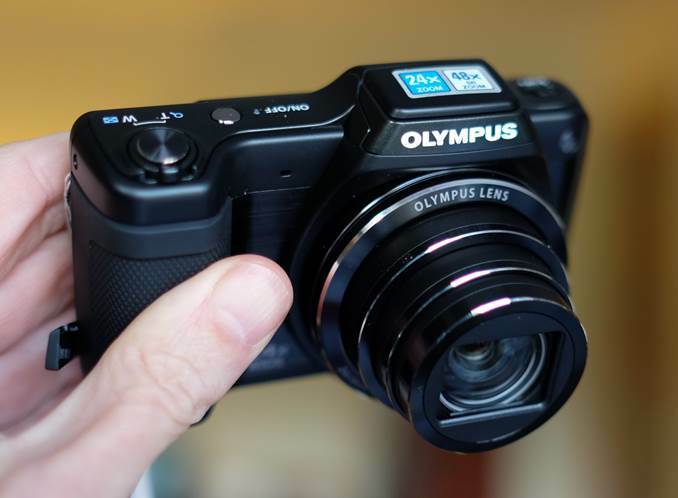 In many ways the Olympus SZ-15 a typical pocket-size point-and-shoot consumer camera: small, light and simple. It’s larger than a lot of pocket cameras; but it’s still relatively tiny. Build quality appears reasonable, but nothing special. It has just enough brushed aluminium to prevent it from seeming really plasticky. Aimed at casual users, it provides a simple set of program modes and it doesn’t even have fully manual override; it just happens to have an unusually long zoom. So what about that lens, then? The specs say that it goes from 4.5mm to 108mm focal length. But combined with a very small sensor that gives a claimed ‘equivalent’ image scale to a 25mm – 600mm! When they say equivalent, though, it’s not clear to what exactly. An APS-C DSLR? A full-frame DSLR? From my experiments, it would seem they are comparing it to a 35mm camera (i.e. a full-frame DSLR), because the image scale at full zoom is smaller than a 600mm lens with my APS-C cameras. Nevertheless, a maximum zoom equivalent to a 350-400 mm telephoto lens on an APS-C camera is still impressive. For use on the Moon we should end up with an image scale similar to that from a small refractor telescope. The SZ-15 has a 1 / 2.3” sensor – the smallest size generally available (which is why it’s able to offer such a powerful zoom). The sensor has 16 Mp which is a lot to cram into such a tiny area. The result of this is relatively poor low-light performance. The SZ-15 offers ISOs settings from 100 to 1600, but it generates a lot of noise above ISO 400, despite doing some kind of automatic dark-frame subtraction. That doesn’t concern us here because the Moon is bright and we won’t need high ISOs. Suffice to say that if you were looking for a point-and-shoot camera to do landscape astrophotography it wouldn’t be this one. Interestingly, the Sony with a 10x zoom (see Moon photo at end) does much better for landscape astrophotography than the Olympus, but it’s not as good for the Moon. The SZ-15 includes a stabiliser: it’s noisy, but seems effective. You can disable it if you are using a tripod. Having taken a brief look at the camera, let’s consider how to set it up to try to get some images of the Moon. To start with, you really need a tripod. That’s not because you will be using long exposures – the Moon is bright so you won’t be. From the point-of-view of shakes you might be able to get away with hand-held photos using the stabiliser. But there is a problem: the SZ-15 has no manual mode, so to force it to focus and expose correctly you need to centre the Moon precisely in the field of view and that means using a tripod. Like most cameras, the SZ-15 has a ¼-20 thread on the base and you can use just about any cheap, light-weight photo tripod. Clearly this is no good: the camera isn’t exposing the view correctly, it’s trying to get an average for all that dark sky and ending up massively overexposing the Moon. You could try exposure compensation, but even setting the maximum value of -2 doesn’t improve things much. 1. Turn the camera on and hit the menu button the back. 3. Now scroll down to ‘ESP’ and select the icon with a dot in a square instead. 4. Whilst you are at it, find the ‘Compression’ setting in the same scroll-down menu and make sure it’s set to ‘Fine’. This produces the best quality JPEGs (this camera doesn’t produce raw files). 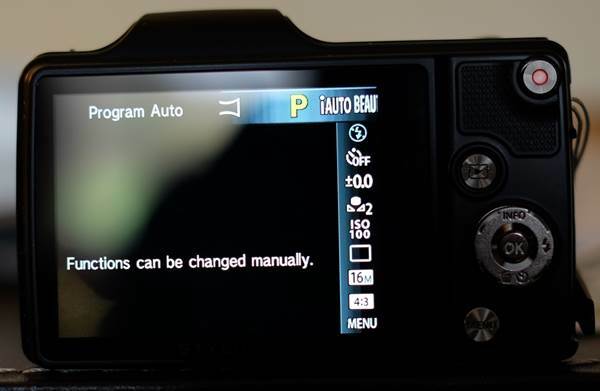 You have now set the camera up to adjust focus and exposure only for the spot in the centre of the field. You will need to select the correct shooting mode and check a couple of other settings. Turn the camera on and hit the ‘OK’ button in the centre of the control wheel on the back. 1. Scroll left and right to select ‘Progam Auto’ and hit OK.
2. Now scroll down and select ‘ISO 100’. This sets the camera to minimum light sensitivity (like we said, the Moon is bright), but maximum picture quality. 3. Scroll down again and select ‘16M’ for maximum picture size. 4. Scroll down yet again and select ‘4:3’ for the picture format. The camera is now setup as well as it can be for our Moon shots. Non-astronomers are often surprised to hear that Full Moon is the night a lot of astronomers shrug their shoulders and stay-in watching the telly: Moonlight blots out anything other than planets, whilst the Moon itself looks least interesting when full. It’s the same reason photographers don’t much like midday on earth – no shadows and a bright sun flatten the landscape and wash out colour and detail. 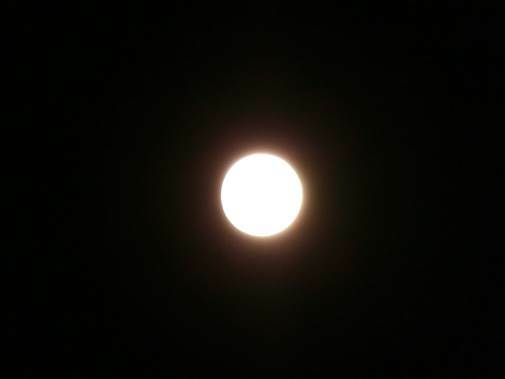 The effect is the same for us, so that full-Moon is the least ideal phase to snap. You will get more interesting photos when shadows are highlighting the topography. Even so, if it’s full Moon, still get out there and have a go! In the long run it might be fun to try capturing as many different lunar phases as you can. Crescents are arguably the most beautiful, but the thinnest crescents very early (and late) in the Moon’s monthly cycle are difficult to find because they are close to the Sun and can be a real challenge to capture with your camera! After all that setting up, you might think that getting out there and actually snapping the moon is a formality. Not quite. The first thing to do (once you’re setup under the Moon) is to get it precisely centred in the metering square in the centre of the frame. This is necessary or the metering won’t expose for the Moon, but for the dark sky around it, as we saw at the start. Once you’ve done that, press the shutter half-way. The camera should now try to focus and adjust exposure for the Moon. It may take a little while to settle down, especially in terms of focus, but it will get there in the end! When it has done it gives a beep and you can snap away. Make sure you regularly download and review your efforts. You may find that playing around with the ISO setting and the exposure compensation can improve your shots. If your images are blurry it might be camera shake. Try incrementally increasing ISO from 100 to 200 and up to 400 to force the camera to use higher shutter speeds, until any camera shake has gone. Precisely which setting works best will depend on the brightness of the Moon (i.e. its phase) and the stability of your tripod. 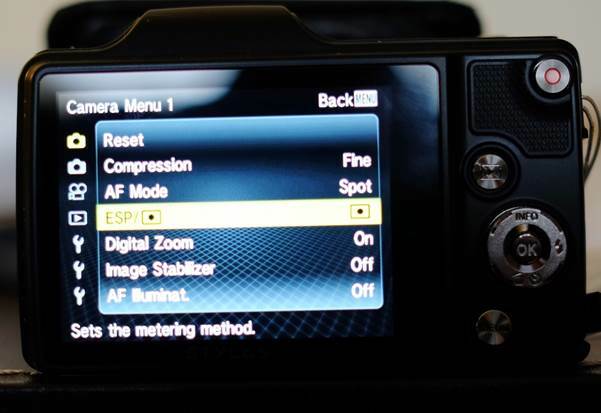 If your photos look washed out, try setting the exposure compensation to under-expose slightly. 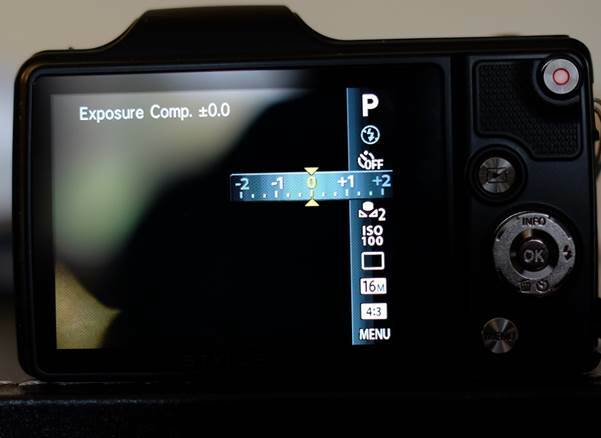 Do this by scrolling down through the menus in shooting mode to the fourth item down: ‘Exposure Comp.’. Try setting this to values between 0 and -1 (beyond -1 is too much, whilst +ve values will over-expose). Once you’ve got some photos you are happy with, you can improve them further using processing software. There are numerous free packages to do this and you only need the basics. The one thing to understand about processing is go slowly, apply subtle changes incrementally. Sharpening your photo slightly (but not too much) will likely improve it. Adjust up the sharpness in tiny steps just until it looks well defined. Too much sharpening looks very artificial. Again, a bit of extra contrast will improve most Lunar photos, but too much ends up with a very artificial look. However, really pushing sharpness and contrast produces a rather ‘painted’ impression which can be pleasing. You may find that colour of your Moon shots is wrong. Typically they may be a bit yellow because the camera has chosen the wrong white-balance. Again you can fix this in post-processing, either directly with white balance (if the package allows it), or with colour temperature. Experiment until you get the proverbial fifty shades (well maybe with a bit of buff thrown in)! This was the best image I was able to get, after several sessions. It’s not great – it’s still a bit blurred, perhaps from lack of perfect focus, or because optical quality is mediocre. It also has a mild colour cast. It’s just a cheap camera after all! Still, it’s an interesting photo with the sort of detail you get through binos and you can make out many of the main features, including a few prominent craters like Langrenus at top right and bright Proclus with its rays at the edge of Mare Criseum; you could easily get an atlas and identify more. 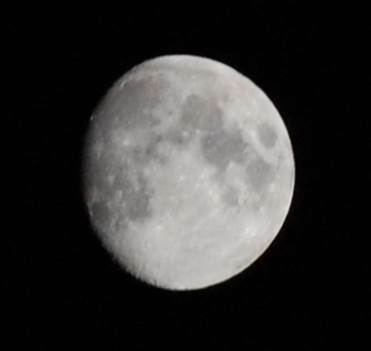 For comparison, below are (cropped) Moon photos taken with three other zoom cameras and lenses. As you can see, the best was taken with a Fuji XM-1 and its 50-230mm kit lens. The Fuji is also a compact camera, but one which takes interchangeable lenses and allows full manual control; it’s a fair bit more expensive and specialist than the Olympus. Compared with the cheap DSLR zoom lens and the Sony with a smaller (10x) zoom, the Olympus does well. From these photos, it seems optical quality and sensor performance are probably more important than shear zoominess, so if you have a zoom camera lying around – especially a bridge camera - you may well be able to do better. Have a go! Moon taken with Nikon D5100 with 50-200mm lens.